An endearing example of Americana, The Sunflower Quilt (78" x 84") is sure to win your heart. 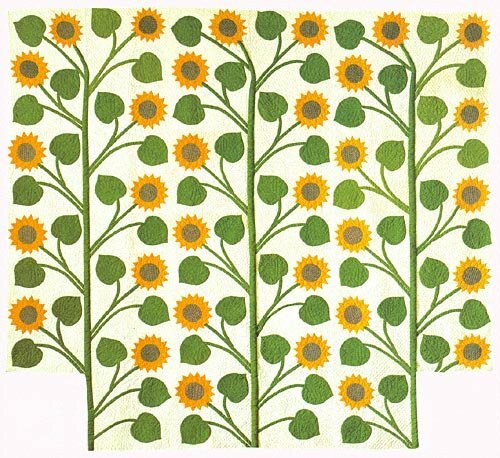 Although appliquéd in 1865, the sunflower motif, a perennial favorite, is as popular now as it was in the 1800s. Make the quilt in the traditional colors, or construct a flower garden of a myriad of colors! The quilt can be either hand or machine appliquéd. Although the original was constructed for a poster bed, two more panels can be made to suit a more modern bed frame.The quilting stencils that depict the actual quilting designs from the original quilt are also included.